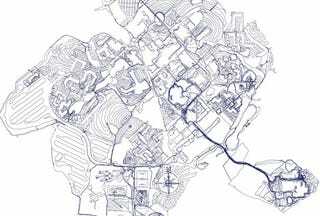 This is a map of The University of Warwick's 700 acre campus. If some of the lines are a little bit squiggly, that's because all 238 miles of them were walked on foot, traced by a GPS satellite. Think of it as cartography for the active set. Jeremy Wood, the intrepid mapper, hoped to inspire people to consider their relationships with the space around them, and to do so he spent 17 days walking the campus, hugging buildings and avoiding paths and roads whenever possible. "Security was called on me twice on separate occasions," he says, "and I lost count of how many times I happened to trigger an automatic sliding door."